Dr. Ramanujam is the Robert W. Carr Professor of Biomedical Engineering, and also a faculty member in the Global Health Institute and Dept. Pharmacology and Cell Biology at Duke University. She is an innovator, educator and entrepreneur and her mission is to develop and leverage technology to have the most wide reaching impact in women’s health. She directs the center for Global Women’s Health Technologies (GWHT), a partnership between the Pratt School of Engineering and the Duke Global Health Institute. Through the GWHT, she is empowering her trainees at Duke and beyond to be agents of change - providing them with the knowledge, confidence and critical thinking skills to create impactful solutions to improve the lives of women and girls globally. Dr. Ramanujam’s research focuses on women’s’ cancers and in particular breast and cervical cancer. Her goals are to design innovations that enable complex referral services often reserved for hospitals to be accessible at the community/primary care level for cancer prevention, and to develop tools that will make cancer treatment more effective and efficient. One example of a technology she and her team has developed to achieve health care impact is the Pocket Colposcope. The Pocket colposcope has the potential to revolutionize cervical cancer screening in low resource communities by enhancing the effectiveness and scalability of the screening process, reducing loss to follow up and guiding effective treatment decisions. The Pocket Colpsocope has been deployed in India, Kenya, Tanzania, Zambia, Peru, Honduras, Guatemala and the U.S. Design is at the heart of the innovation that underlies the Pocket colposcope. Dr. Ramanujam and her team have created a unique model to make design thinking and execution pervasive and in the process have created teachers, innovators and entrepreneurs outside of Duke. The program known as Ignite, has trained more than 50 university students to teach design thinking to more than 1000 students in low resource communities in Kenya, India, Guatemala and the U.S. The students in those communities then perpetuate the knowledge by maintaining that virtuous cycle within their own communities. These interactions have resulted in a community that is growing exponentially and has an international reach across a number of different sectors including academia, industry, non-governmental organizations and the government. Prof. Ramanujam has received recognition for her work in women's health and empowerment. She received the TR100 Young Innovator Award from MIT, the Global Indus Technovator award from MIT, Era of Hope Scholar awards from the DOD, the Stasnell Family award from the Pratt School of Engineering at Duke and the Emerging Leader in Global Health Award from the Consortium of Universities in Global Health (CUGH). 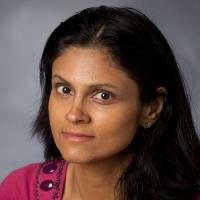 She is a fellow of several optical and biomedical engineering societies including OSA, SPIE AIMBE. She has also been elected to the National Academy of Inventors. She is co-editor of the Handbook of Biomedical Optics. She has presented the global impact of her work at the United Nations. Innovating on optical strategies to peer into the biological landscape of thick tissues. Technologies being developed in her lab leverage principles of optical spectroscopy, optical sectioning microscopy, and molecular imaging. Her research group is developing and applying these optically based tools for three problems in cancer: cancer screening in resource-limited settings, intra-operative margin assessment to detect residual disease during cancer surgery, and visualizing tumor hypoxia and metabolism in the context of cancer therapy and drug discovery. Prof. Ramanujam is leading a multi-disciplinary effort to translate these technologies to clinical applications in the breast, and cervix. Palmer, GM; Zhang, H; Lee, C-T; Mikati, H; Herbert, JA; Krieger, M; von Windheim, J; Koester, D; Stevenson, D; Rocke, DJ; Esclamado, R; Erkanli, A; Ramanujam, N; Dewhirst, MW; Lee, WT, Assessing effects of pressure on tumor and normal tissue physiology using an automated self-calibrated, pressure-sensing probe for diffuse reflectance spectroscopy., Journal of Biomedical Optics, vol 23 no. 5 (2018), pp. 1-8 [10.1117/1.jbo.23.5.057004] [abs]. Martinez, AF; McCachren, SS; Lee, M; Murphy, HA; Zhu, C; Crouch, BT; Martin, HL; Erkanli, A; Rajaram, N; Ashcraft, KA; Fontanella, AN; Dewhirst, MW; Ramanujam, N, Metaboloptics: Visualization of the tumor functional landscape via metabolic and vascular imaging., Scientific Reports, vol 8 no. 1 (2018) [10.1038/s41598-018-22480-w] [abs]. Asiedu, MN; Simhal, A; Lam, CT; Mueller, J; Chaudhary, U; Schmitt, JW; Sapiro, G; Ramanujam, N, Image processing and machine learning techniques to automate diagnosis of Lugol's iodine cervigrams for a low-cost point-of-care digital colposcope, Progress in Biomedical Optics and Imaging Proceedings of Spie, vol 10485 (2018) [10.1117/12.2282792] [abs]. Crouch, BT; Duer, J; Wang, R; Gallagher, J; Hall, A; Soo, MS; Hughes, P; Haystead, TAJ; Ramanujam, N, Optimizing fluorescently-tethered Hsp90 inhibitor dose for maximal specific uptake by breast tumors, Progress in Biomedical Optics and Imaging Proceedings of Spie, vol 10478 (2018) [10.1117/12.2285210] [abs]. Zhu, C; Martin, HL; Li, M; Crouch, B; Martinez, AF; Palmer, GM; Dewhirst, MW; Ramanujam, N, Non-invasive, simultaneous quantification of vascular oxygenation, glucose uptake and mitochondria membrane potential in a flank tumor model, Optics Infobase Conference Papers, vol Part F91-TRANSLATIONAL 2018 (2018) [10.1364/TRANSLATIONAL.2018.CF2B.2] [abs].